My dad has always attracted animals of all kinds, but especially birds, so I made him this card featuring the See Beauty cling mount rubber stamp set from Red Rubber Designs, getting a head start on Father's Day! 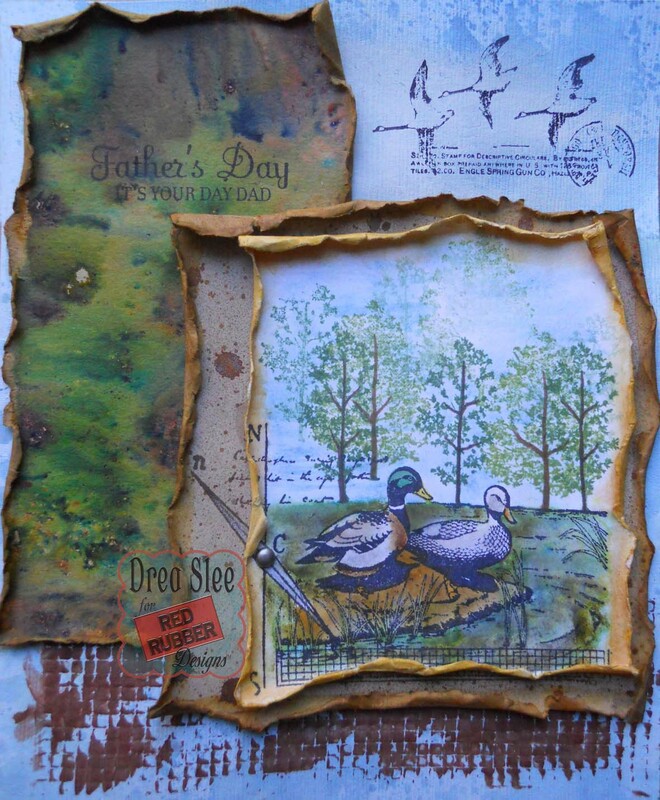 I stamped and layered the duck image with white and kraft cardstock, coloring it with Distress Inks, and spraying the background of the kraft cardstock with some brown sprays. 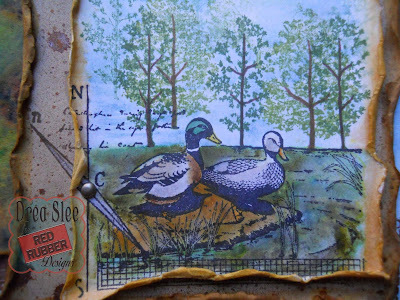 Then I stamped some trees using the Tree Silhouettes cling mount rubber stamp set, going over the trunks and branches with a brown marker. 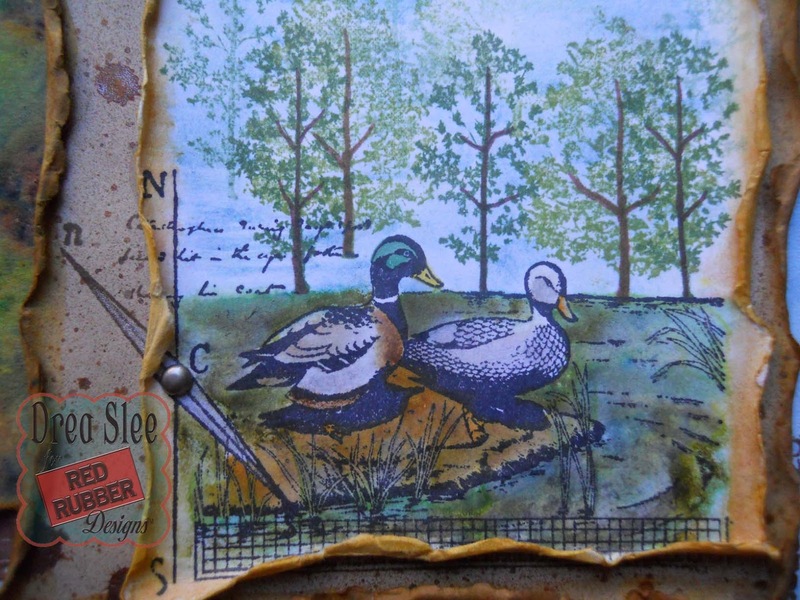 I was very pleased with the piece where I stamped my sentiment using the Contemporary Greetings unmounted rubber stamp set, and mixing green and brown Magicals to create my background, which gave it some texture as well. I also used brown Magicals and sprays added to some clear gesso, to mask a strip of drywall tape along the bottom. 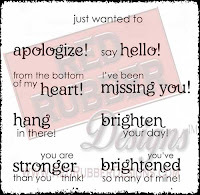 So get started on your Father's Day cards, and find your perfect image at Red Rubber Designs! Hello, friends! 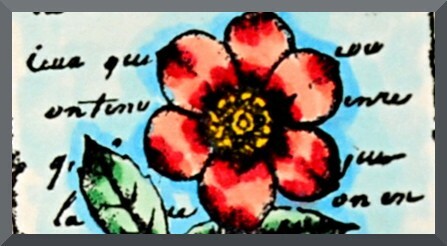 Angie here with part II of my Floral Collage project! I had so much fun creating the blue sequin card with the mini gardenia image a couple of weeks ago, I couldn't wait to create with the second stamp in the Floral Collage Cling Mount stamp set from Red Rubber Designs. 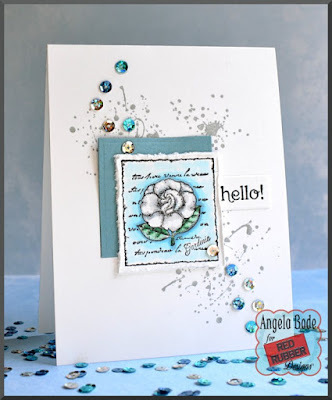 This time, I chose accents in pink and a sentiment from Joyful Notes. 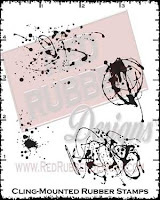 I once again I had fun adding splatters with So Splattered Cling Mount stamp set. I chose pearls to go with the doily for an extra touch of femininity....and well, I don't have sequins to match the flower! 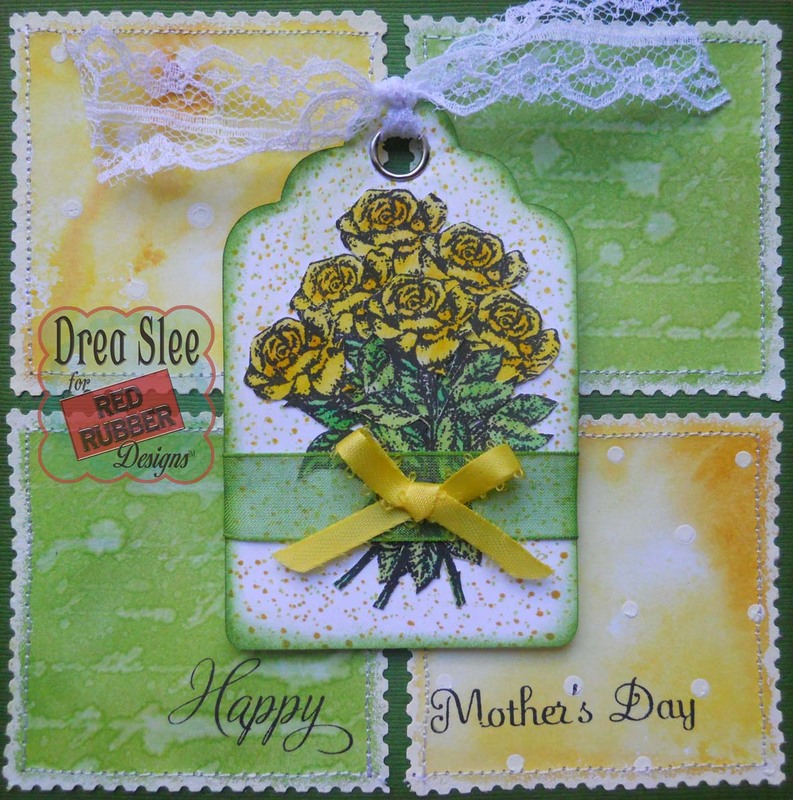 Just for fun I am adding the photo of my first card created with the Floral Collage Cling Mount stamp set and I am including the list of stamps used in both projects. 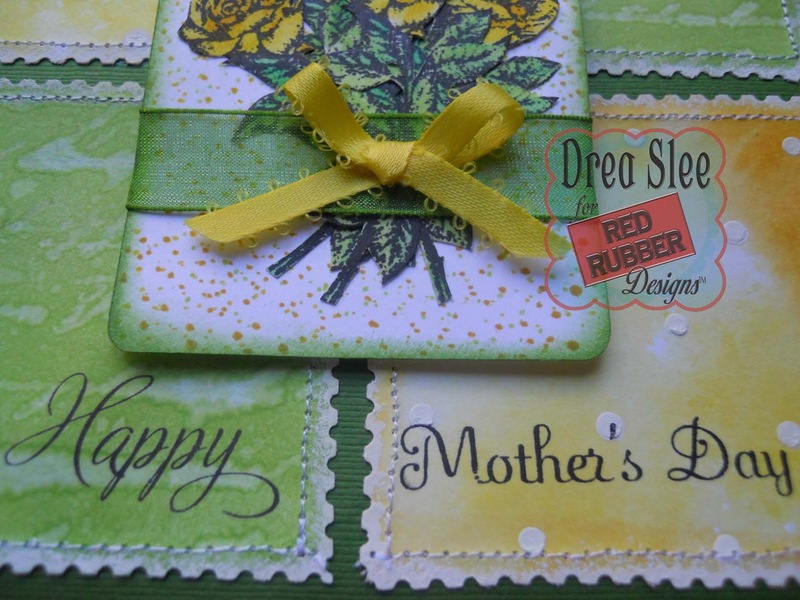 What mother doesn't like to receive flowers for Mother's Day? 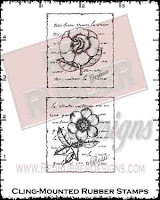 By using the Charcoal Flowers stamp from Red Rubber Designs, you can give her flowers that will last a lifetime! 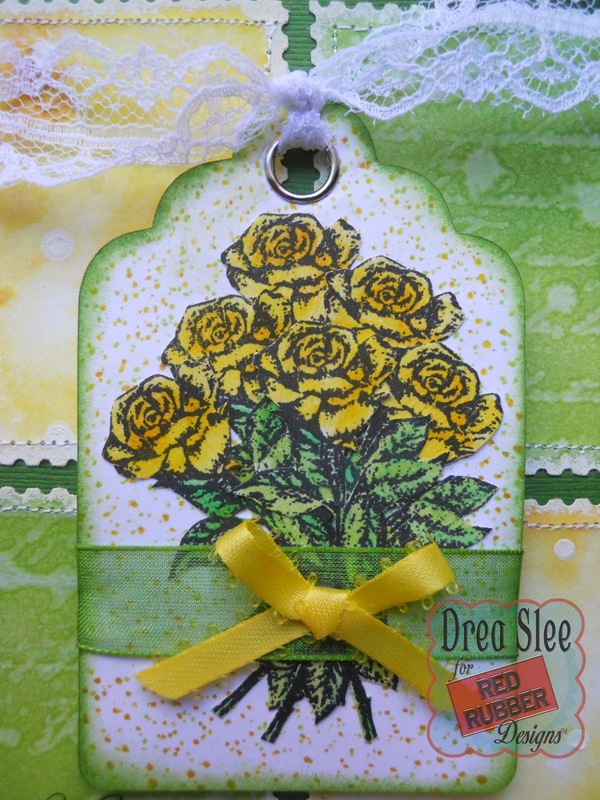 I chose the rose stamp, colored them with Distress Inks, and tied them up with some ribbon on this tag that I added to my card. 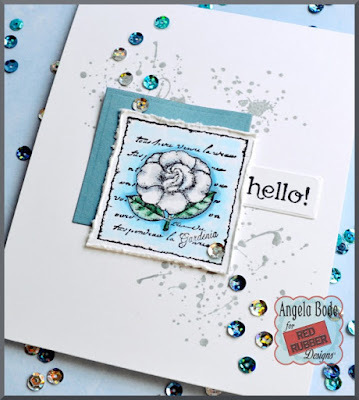 The background of the tag was stamped with the Speckle Background stamp, and raised up with some pop dots for some dimension. 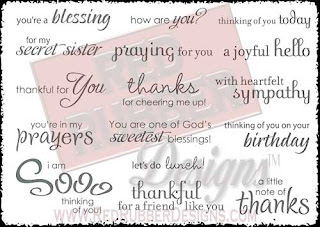 For the sentiment I used the Contemporary Greetings stamp along the bottom of the card. 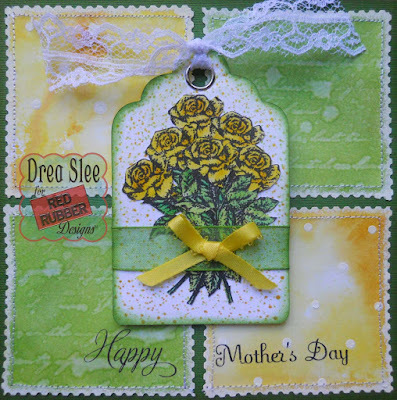 The background squares were also colored with Distress Inks, cut with decorative scissors, and machine stitched around the edges. I added some dots onto the yellow squares with a stencil and gesso. To the green squares, I used water with the Beauty Of A Woman Background stamp to create a softer look with the script.